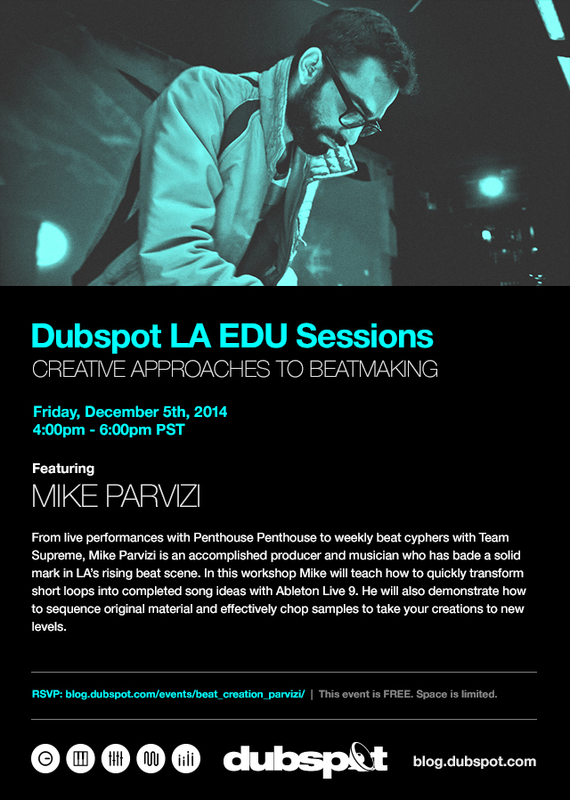 On Friday December 5th our Dubspot LA EDU Fall Sessions continue with a special workshop on Ableton Live beat creation with multi instrumentalist and accomplished producer Mike Parvizi (Team Supreme). Whether he’s touring the globe in support of The Glitch Mob, hosting weekly Beat Cyphers with Team Supreme, or selling out shows as one half of Penthouse Penthouse, Mike Parvizi consistently shines as one of the hardest working producers in Los Angeles. One skill that has put Mike on the map as a producer and a Dubspot instructor is his ability to quickly construct songs from just a few elements in Ableton Live. During this workshop Mike will teach how to quickly transform short loops into completed song ideas and how to effectively chop samples and create sequences for beat creations. To keep up with Mike, follow him on Twitter, Facebook and check out Penthouse Penthouse’s releases on Bandcamp.